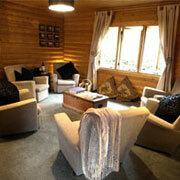 Redlands Country Lodge is a bed & breakfast with a difference near Cupar, Fife. We're different from many B&B's in that all of our rooms are completely separate from the main house so you can come and go as you please whilst exploring Fife. 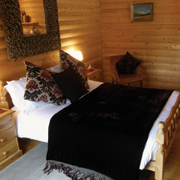 With rates from £35pppn* you can stay for as little as one night in one room or book all 4 rooms for 8 people from £280**. We can sleep 12 people when you combine our log cabin rooms and our self catering apartment ‘WeeBothy’ which is right next door. Our mini-self catering apartment ‘WeeBothy’ is a little converted sandstone building, right next to the log cabins. Sleeps to 4 and is ideal for family breaks or a romantic break for 2 – indeed we’ve had several honeymoon couples stay. It has a cosy bedroom (with twin or kingsize bed), wee designer bathroom, relaxing lounge with double sofa bed and kitchen area (with microwave, fridge, toaster, kettle etc) Patio doors open from the lounge to a decked area overlooking the fields beyond. It’s mini self-catering at its cutest and it’s available from £50pppn based on 2 sharing/min 2 night stay. Late booking rates are always available, please check our availability calendar above. The relaxed atmosphere at Redlands Country Lodge Guest House means you can enjoy a great night's sleep and tuck in to a hearty Scottish breakfast served in the glorious conservatory garden room. Our own free-range hens to provide fresh eggs – they make fabulous scrambled eggs! We offer cooked or continental style breakfast, with yoghurts, seasonal fruits, & use local jams and produce wherever possible. If you're in need of a lie-in, we'll provide a continental breakfast tray for you in your room the night before. Check out is now 11am, bliss!